New Orleans is famous for it's jazz music. However, the Crescent City's culture has influenced musicians from Louis Armstrong to Led Zeppelin. 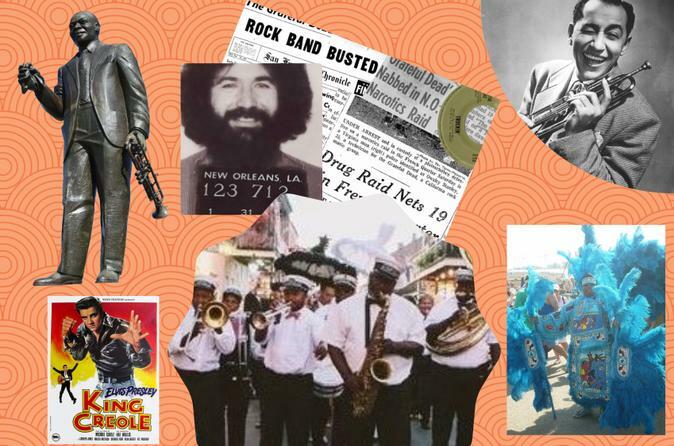 This is a look at New Orleans' international influence on pop culture in regards to the music industry. You will see where musical legends first performed and the first Rock n Roll recording studio in the world. Although our focus is on music, we will also point out several locations used on both the silver screen and television. The tour will last about 2 hours and is 1.3 miles of walking with an opportunity for a break. On this tour you will be guided through the French Quarter and Armstrong Park to see where local and international legends of Jazz and Rock n Roll were influenced by the Big Easy. The tour will begin behind the statue of our city's founder, Jean Baptiste de la Moyne sieur Bienville. You will walk down our most famous street, Rue Bourbon and beyond to Congo Square where jazz music is rooted. The tour will end for your convenience, near the French Market, public restrooms and a streetcar stop (Yes, bars and restaurants too!). * Occasional sampling of music recordings.